There are many different means of contagion for zombies. One can become a zombie in different ways based upon what sort of zombie plague is upon us. The vectors vary widely. Direct infection through transference of bodily fluids from a zombie, radiation or other mutagens, a virus – all are staple means of becoming a zombie in science-fiction and horror. Yet those means pale in effect and virulence as compared to the real world zombie infection – college. 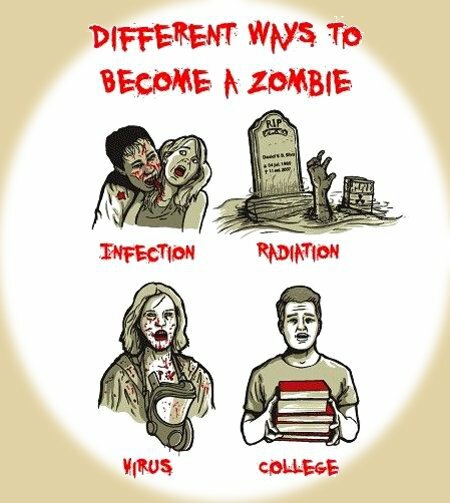 Between their ongoing efforts to destroy the capacity for independent thought in favor of Liberal indoctrination and their focus on training through rote in order to churn out good little cogs in the various machines, all American colleges and universities are is zombie spawn points. This entry was posted on Saturday, April 14th, 2012 at 7:40 am and is filed under Humor, Politics, Society. You can leave a response, or trackback from your own site. I get your point, but how would I differentiate that blank stare from any other blank square the average college student would give me if I asked them a question?